The world mostly knows Oscar Zeta Acosta as he was caricatured into a 300-pound Samoan attorney by Hunter S. Thompson. Later he was portrayed by Anglo Actor Peter Boyle in the film Where the Buffalo Roam. Puertorriqueño Benicio Del Toro played him in the film version of Fear and Loathing in Las Vegas. 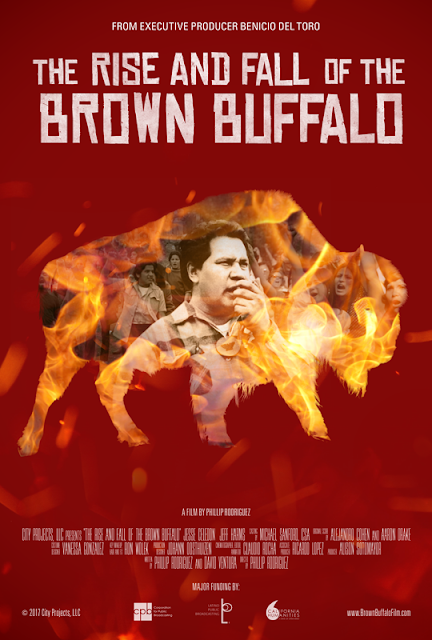 Now there’s a movie all about him: The Rise and Fall of the Brown Buffalo. This film is a dramatization. It is based on historical record - personal letters, journalistic and literary accounts. Actors play real people and are shown along with actual footage. It straddles the bio pic and documentary genres, as well as fiction and nonfiction. That’s a Chicano thing, gonzo journalism, magic realism. Plain old realism and categories just ain’t enough, cabrones! And it works. I sometimes lost track if I was seeing Acosta or the actor Jesse Celedon, who plays it more like the news clips than the drug-crazed maniac from the movies. Jeff Harms plays a surprisingly clear-headed Hunter Thompson, pouring whisky while delivering the author’s words with a biting, cynical edge, rather than the mumbling, spaced-out mimicry of Bill Murray and Johnny Depp. The result brings Acosta to life with the humor and brutal honesty of his books. We get glimpses of the man through that media myth, providing a good introduction for those who would like to read his books. The film focuses on his career as an attorney and activist, but also covers his writing career, and how difficult being a Chicano writer is. He had to threaten a lawsuit to get his books published, which is of special interest to me, because I keep getting called a successor to Acosta. He has certainly been an influence on my work. I don’t consider myself to me another Dr. Gonzo. I go easy on my cerveza, and I haven’t touched any illegal drugs in decades. Still, people read my stuff and imagine me sprinkling peyote flakes on my huevos rancheros, and prowling the streets in a lowrider, seeking virgins to sacrifice to Tezcatlipoca. I do see how the connection is made. I have a bad attitude. I’m not an academic. My relationship with Western Civilization is antagonistic. New York treats me like the the most talented leper they ever met. I scare the sort of people publishers think buy books. I refuse to go down in flames like a good, little minority writer. So I keep that foot firmly planted in the underground, so I’ll have a place to stand when things get hairy. Sure they may change, but it’s going to be a long, hard guerrilla campaign. The Corporate Culture Machine has only just now realized that black people actually exist. It may take a while for them to see all the shades of brown, the buffaloes, the cockroaches, the high-powered mutants never considered for mass production. Meanwhile, I recommend The Rise and Fall of the Brown Buffalo. See it. And dig in, sandwich Fear and Loathing in Las Vegas between Autobiography of a Brown Buffalo and Revolt of the Cockroach People, as a weird, disjointed, distorted--after all, isn’t all art distortion?--trilogy that lets certain truths be self-evident, and kindles some vicious laughter. I have a feeling we’re going to need it in the near future. 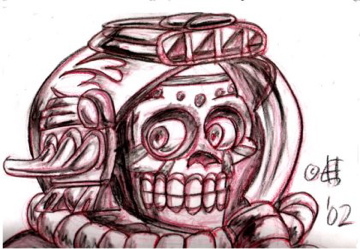 Ernest Hogan has been called the Father of Chicano Science Fiction. Rumor has it that he’s an Aztec priest or a techno-shaman. His novel Smoking Mirror Blues is now available in a new edition.